Multi sensor measurement systems make it possible to acquire data points from a complex part with multiple sensors and probes. During the inspection process integrated software uses these data points to determine geographic relationships which are closely compared to the part’s design drawing. Each sensor is used for a specific measurement purpose to ensure maximum efficiency and to verify the part’s dimensions, for this reason metrology machine efficiency within the medical device quality control process is imperative. Specialist medical devices demand precision measurement to ensure they are fit for their intended purpose in both form and functions. Ear, nose and throat (ENT) applications such as the parts that form the middle ear prosthesis often consist of extremely small components and these medical devices, regardless of size, are primarily made to exacting tolerances. Therefore the measurement and inspection technology used in characterising customised medical devices need to deliver the highest accuracy, and often to submicron level. Orthopaedic implants including prosthetic hip ball joints, or tibial and femoral knee and ankle implants have proven to be extremely hard to measure accurately due to their complex and often customised geometries, being made to fit individual patients. Defining their shape and surface are higher-order curve fittings made up of ‘Non-Uniform Rational B-Splines’ (NURBs) or varying point coefficients. Forming variable and organically curved shapes that are designed to fit with mating prosthetic parts and even bone joints inside the body. The complex 3D curves that make up the part often cause difficulty within the measurement process, especially in measuring all surfaces from a single direction which results in certain types of sensors being unable to collect data points from them. Video-based metrology systems are especially good at measuring edges with ease, making them well suited to measuring parts that contain intersecting planes such as a prismatic devices. But using video measurement for orthopaedic implants proves difficult due to their shape, often made up of regular continuous curves, such as hip components, or complex contouring, including knee component surfaces. Shapes that are designed to mimic the organic contours of natural body parts are often the hardest components to measure because they have few or no intersecting edges or planes. Video sensors primarily excel in measuring edges through illumination from behind the part’s intersections, limiting its capability in measuring curved surfaces. And although video has the ability to measure specific surface points, this process would be impractical for orthopaedic implants due to having to collate multiple points of focus in order to gather enough data to support even a linear section of its contoured surface. A touch trigger probe would be similarly limited and impractical within the manufacturing environment because each individual point would require approach, trigger and back off, subsequently wasting time and reducing production throughput. An efficient method of verifying organically curved parts is with laser measurement technology. For example, when measuring a replacement knee, laser sensors would be used, projecting light towards its curved surface, collecting the reflected and scattered light as data points, and automatically calculating the offset from the measured point between the laser and the part in a 3D axes to generate a dimension. Lasers are suitable for both single point measurement, as well as the collection of a series of data points where operators can specify the point spacing and sampling rate. Advanced metrology software continuously calculates the distance between the laser and the part’s surface while the laser beam passes across it, and keeps the laser within its specified capture range through closed-loop positioning of the Z-axis stage control on the multi-sensor measurement system. Limiting the laser to its capture range allows for precise point positions to be collected quickly and efficiently. Laser sensors avoid potential damage to the part surface or contamination of sterile parts due to their non-contact nature, and are also more effective through faster and higher accuracy than video autofocus devices. Operators, in many cases, may not be able to fixture the knee replacement to assure a direct line of sight between the part’s critical surfaces and the laser sensor. In which case mounting the replacement in a rotary indexer may prove efficient as a solution, as well as offer a prime opportunity to maximise measurement throughput with the elimination of multiple positional fixtures whilst also cutting down on manual part handling. A datum is established from surfaces on the back of the knee part with a touch probe sensor. Then rotating the knee replacement, the rotary indexer presents its desired surface to the laser sensor in order to be measured. Due to this positioning of the defining datum being derived from the opposite side, it is important that the metrology system is equipped with fully 3D-capable measurement software that enables the coordinate system to rotate in unison with the indexer. 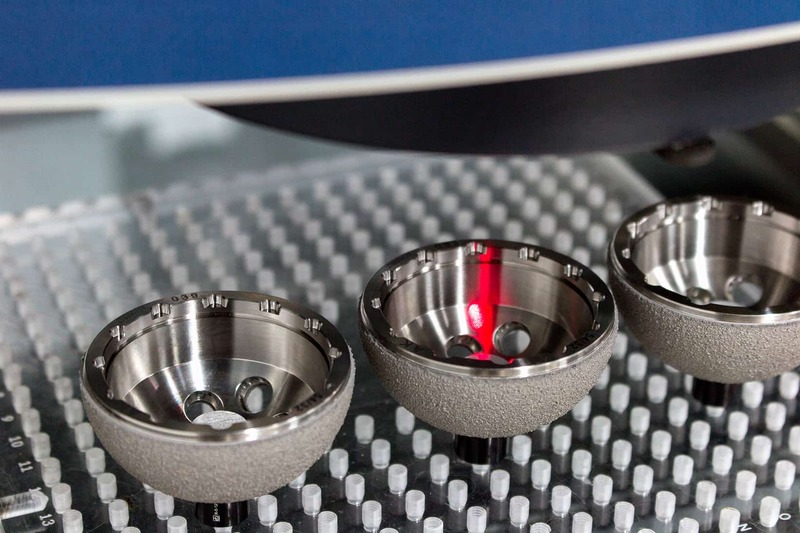 This functionality allows for every data point that is captured by the laser to be tracked in 3D space by metrology software regardless of the rotary indexer positioning. Another method of measuring the complex contours of a prosthetic knee implant is with a multi-sensor system equipped with the Renishaw SP25 scanning probe. 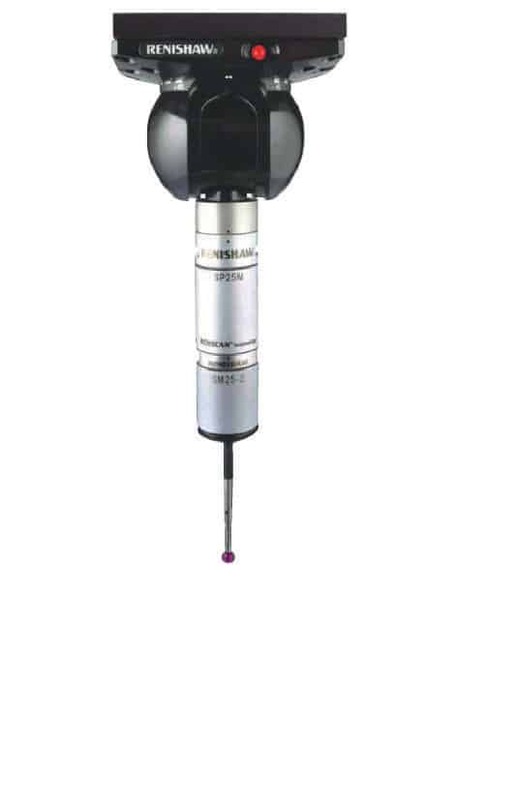 Similar to the laser sensor, the operator determines start and end point scanning specifications, allowing for the probe tip to continuously acquire data points as it maintains constant contact with the implant’s surface. Touch probes, although similar to touch trigger probes, work by maintaining contact with the part’s surface instead of backing off when coming into contact with a surface. Much like a laser, the data point density scan rate are user-definable. Multi-sensor systems must be configured for the SP25 with integrated 3D capable metrology software to track the data points in XYZ space. A linear laser or contact probe scan can be carried out across the rotary-fixtured knee’s surface providing a line scan which represents a section across the 3D part which, using a video sensor, can then be measured as an edge. This is carried out by rotating the replacement knee part 90 degrees and illuminating it from behind, creating a distinct edge of that section. This technique of measurement requires state-of-the-art metrology lens capability with a long working distance that remains undeterred by the knee’s varying steep surfaces. Functions such as ‘Edge Trace’ are especially beneficial for applications like this where the section being measured is larger than the optical field of view, acquiring and collecting data points at each position by automatically following the detected edge over multiple fields. The knee’s entire surface can also be measured by rotating it incrementally a few degrees at a time when mounted in a rotary indexer, performing multiple linear scans (or edge traces). With tight point sampling density, the collection of all the points from these multiple scans will yield point clouds of data. Through data analysis and design drawing comparison, informed choices can be made based on your current manufacturing operations. Conventional methods involved interpreting printout data sheets of individually measured values. Multi sensor measurement machines therefore result in significant time savings through the collection of large sets of data, making for easier decision-making and optimised efficiency within your inspection processes. The collected point clouds can then be imported into 3D-capable fitting software which with intelligence of the knee’s rotation will be able to represent how all the part data coincides with the CAD model of the part. Many fitting software programmes even possess the ability to conduct GD&T analysis of the point cloud data, satisfying simultaneous requirements as well as presenting graphical deviations from the design file. This information can then be used for both acceptance testing of individual parts and as an intuitive decision making tool in which operators can make changes to existing manufacturing processes, based on the collated information, in order to maximise accuracy and efficiency in part manufacturing. GD&T analysis of point cloud data potentially offers conclusions critical to individual manufacturing processes, which would not be immediately recognised otherwise. For example, point cloud data alone may indicate that two perpendicular linear laser scans are within specification, whereas GD&T analysis of both scans may show that the entire part is actually out of tolerance. To find out more about how OGP UK helps the medical industry to produce precision medical devices, visit: https://ogpuk.com/industries/medical/ or contact the dedicated team of engineers at OGP UK by calling 01283 585933.